At Rob’s 4 Wheel Drive & Diesel Performance we start with the manufactures suggested interval, the most common being every 30,000 miles. We recommend an automatic Transmission Fluid Exchange Service with a filter being replaced every other time. Why a fluid exchange? Most automatic transmissions hold a minimum of 12 quarts of fluid. When the pan is removed and the filter changed you only get 3 to 5 quarts of fluid out, leaving 2 thirds to 3 quarters old fluid in the torque converter, lines, filter and hoses. When Honest-1Â® performs a Transmission Fluid Exchange Service we get all the old fluid out and replace it with new. It just makes sense. By performing a fluid exchange at regular intervals the filter can be replaced every other time. The transmission fluid will also tell you if service is needed before the manufactures suggested interval. If the transmission fluid is starting to turn brown it is an indicator that a service should be performed. We check your transmission fluid during our famous Honest-1Â® 21-Point Inspection. At Rob’s 4 Wheel Drive & Diesel Performance we offer three Automatic Transmission Services to protect your transmission. They are the Basic, Preferred, and Supreme. Some automatic transmissions are manufactured with a drain/check plug to perform a drain and fill service. 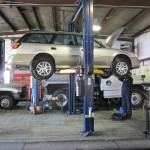 This service offers the Transmission Fluid Exchange Service plus a Transmission Filter Replacement.